This is an easy recipe and simply delicious. 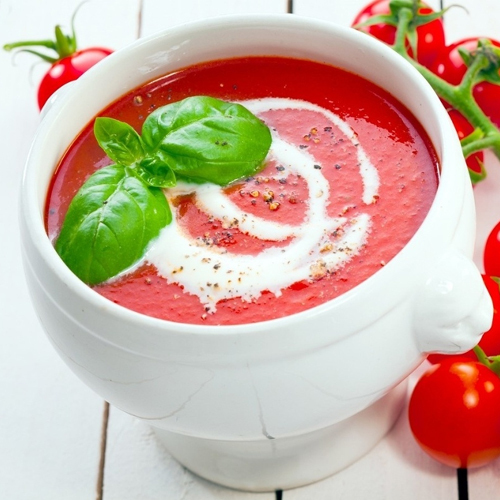 Tomato Soup is always good as a starter or light meal with salad and crusty bread. 4 cups finely chopped ripe tomatoes, 1 bayleaf (tejpatta), 3 whole black peppercorns (kalimirch), 1 1/2 tbsp butter, 1 tbsp plain flour (maida), 1/4 cup tomato puree, 2 tsp sugar, salt and to taste, 1 1/2 tbsp fresh cream. 1/4 cup deep-fried bread croutons. Combine the tomatoes with 1 cup of water in a deep non-stick pan, add the bayleaf and peppercorns, mix well and cook on a medium flame for 8 to 10 minutes, while stirring occasionally. Remove the bayleaf and discard it. Allow the mixture to cool completely. Blend the mixture in a mixer till smooth and strain it using a strainer. Heat the butter in a deep non-stick pani, add the plain flour and sautÃ© on medium flame for 1 minute. Add the prepared tomato mixture, 1 cup of water, tomato purÃ©e, mix well and cook on a medium flame for 1 minute. Add the sugar, salt, pepper and fresh cream, mix well and cook on a medium flame for 2 minutes, while stirring occasionally. Garnish with fresh cream and serve hot with bread croutons.